This is 2 dozen of my newborn fitted diapers. 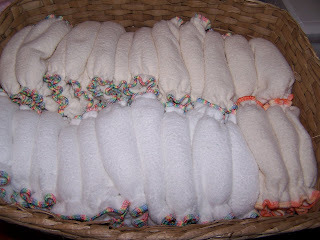 I have lots more diapers made up I need to buy a new basket put them in. The baskets we used to hold all our diapers and stuff on our changing table when DD was a baby are now all being used holding her toys. My hubby offered to get me all new baskets but I told him we should just get one at a time as I make stuff. I feel better treating myself to a $10 basket AFTER I have worked on making enough stuff up to fill the basket. I would feel bad if I had a bunch of (about 9) empty baskets when the baby is born. I would feel that I wasted a lot of money on baskets. I guess I am a person who would rather waste money on fabric and fiber than baskets. LOL!